A new study suggests people who earn money by committing crimes such as selling drugs, burglarizing homes and cashing forged checks make more than $900 a week, on average. The issue: Some crimes do pay and some people make a living off crime. Often, these individuals have trouble securing a regular job or are only qualified for low-wage positions. Some people commit a variety of crimes — from pickpocketing and shoplifting to robbing a bank and selling drugs and weapons — to earn income. To help fight crime, scholars and policymakers need to better understand why people commit crimes to get money and how much they bring in. A new study offers new insights. A study worth reading: “On the Reliability and Validity of Self-Reported Illegal Earnings: Implications for the Study of Criminal Achievement,” published in Criminology, August 2017. Study summary: Holly Nguyen of Pennsylvania State University and Thomas Loughran of the University of Maryland-College Park try to gauge how much money people earn through criminal activities and whether self-reports of illegal income are reliable. Nguyen and Loughran examine two sets of data — one collected through the Pathways to Desistance Study and the other through the National Supported Work Demonstration Project (NSW). Individuals who participated in the Pathways study were convicted of a felony at some point between the ages of 14 and 17 and then were tracked for seven years. They were interviewed about illegal work and illegal income. The final sample comprised 368 individuals, most of whom were male and either black or Hispanic. The average age of participants was 21 years. Individuals who participated in the NSW project, a program offered at 15 sites nationwide, were unemployed and had a history of employment problems but may not have had criminal backgrounds. These individuals also were asked about illegal earnings and activities. The 1,189 people in the final sample were primarily male and black and ranged in age from 16 to 49 years. Those who participated in the Pathways study reported earning an average of $1,470 a week through criminal activities. Individuals participating in the NSW project reported earnings of $914 a week, on average. In 83 percent of interviews with Pathways participants, they reported selling drugs for money. In 12 percent of interviews, they reported engaging in robbery. Respondents said they made money through burglary in 41 percent of the interviews. About 26 percent of Pathways interviewees said they engaged in at least one of the following crimes: shoplifting, buying/receiving/selling stolen property, using checks/credit cards illegally, stealing a car or motorcycle, stealing something worth more than $100 and entering a building to steal. About 44 percent of Pathways participants did not complete high school. Participants reported working a traditional job an average of 11 weeks over a one-year period. In 55 percent of interviews with NSW participants, they reported selling drugs to earn money. In slightly more than 8 percent of interviews, they reported engaging in robbery. An estimated 38 percent of participants said they had engaged in other income-generating crimes such as pickpocketing, selling weapons, embezzling, selling stolen vehicles and forging stolen checks. More than 67 percent of NSW participants did not have a high school diploma. NSW participants reported spending an average of 57 hours working a traditional job over a nine-month period. For both groups, those who did more legal work tended to have lower illegal earnings. For every $1 earned legally, there was a 7-percent reduction in illegal earnings. The Federal Bureau of Prisons provides data on its inmates, including their criminal offenses. As of late July 2017, 46.3 percent of prisoners were incarcerated for drug-related crimes. The Internal Revenue Service requires money earned through illegal activities, including drug dealing, to be declared as taxable income. The U.S. Department of Justice, through its Asset Forfeiture Program, seizes money, property and other assets affiliated with criminal activities. This 87-page report from the Office of the Inspector General offers details about assets seized during the fiscal years ending on September 30, 2015 and September 30, 2016. 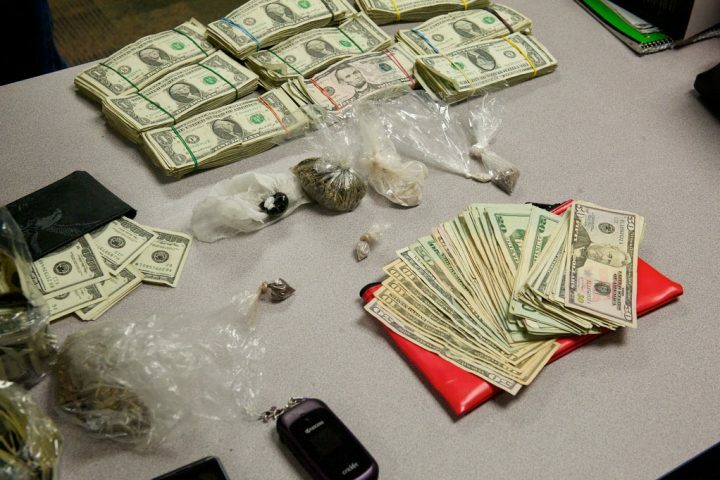 A 2012 study published in Criminology, “Dealers, Thieves and the Common Determinants of Drug and Nondrug Illegal Earnings,” suggests that most people who sell illegal drugs also engage in other forms of income-generating crime. Citation: Nguyen, Holly; Loughran, Thomas A. “On the Reliability and Validity of Self-Reported Illegal Earnings: Implications for the Study of Criminal Achievement,” Criminology, August 2017. DOI: 10.1111/1745-9125.12144.